Lately, I've been making some small pillow changes in our living room mainly to give it a little more color. If you follow us on Facebook, you know that we purchased these new bamboo blinds from Lowe's several months ago. Previously, we had sheers on the windows and I was beginning to hate how they really absorb dirt and dust. For a family with allergies, that's not so good. So, we ditched them and purchased the bamboo blinds. They are the roll-up kind and inexpensive. By far, the question I am asked the most via email is where did we buy our bamboo shades in our kitchen and dining area. Unfortunately, I don't think they are available any longer. We bought them about 6 years ago and recently tried to find another set without any luck. But I like these just as much. I was so excited to come across this pillow cover at Restoration Hardware ON CLEARANCE a few months ago. It's a tiny pillow but who cares. I loved it and it wasn't a budget buster. The fabric on the pillow behind it came from here. It was almost $16 per yard but I just bought a half a yard, cutting the price in half. I love that fabric.com will allow you to buy a half instead of a whole. With blueberries in abundance right now, not to mention affordable, I've been having fun making some of our favorite summer sweets. One of those is blueberry scones. But with the heat of the summer, the last thing I really want to do is roll out dough. That's why I love this recipe. You throw the dough together and drop it in heaps on the baking sheet. And no chilling, rolling and cutting dough into triangles. Let me tell ya, the star here is definitely the orange glaze. Without it, these are just ordinary scones. With it, they are really something special. you just can't go wrong with melted butter, fresh squeezed orange juice and powdered sugar. I may or may not have eaten 4 of these just while taking the photos. Tip: To make the glaze super easy to drizzle on your scones, as well as super cute, I like to use those plastic cake decorating squeeze bottles available in the cake decorating department of the grocery store. They're cheap and also perfect for storing your homemade snow cone syrup. Hey there! I hope you are all having a good day. I was so excited after reading the comments on this post because thanks to readers Michelle and Marci, I learned what these were. My hubby found just these few in a storage shed he bought the contents of. So, because of their help, I was able to purchase a full set. Which means that now I can engrave my bread boards! Yay! I'm so excited about doing this because I think being able to personalize them for you makes them extra special. fit the side of the board perfectly. Engraving will only be done on one side. 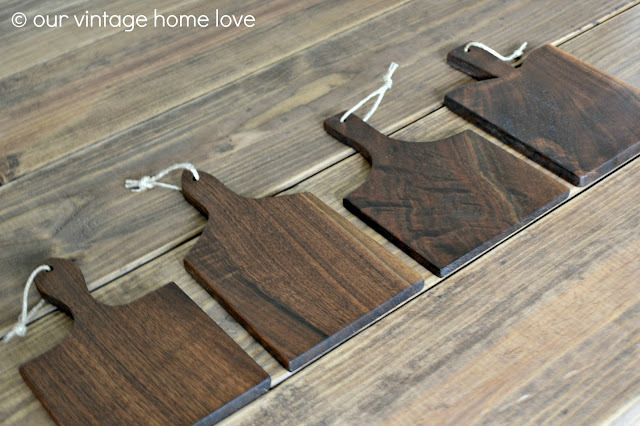 Here's a look at how they look on the maple and walnut boards. I just used the word EAT as an example. You can have anything put on the boards that you'd like, up to 10 characters. For FREE. There will be no extra charge for adding the engraving to the side of the board. We came across a piece of cherry wood in among all the walnut. Cherry was my Dad's very favorite wood so I made a board for me in his honor with his name on it. I know he would've loved it. It would be fun to have each person's name in the family engraved on a set of mini bread boards. I'm going to do that for my family boards. up to 10 characters TOTAL. My hubby and I have been married for 20 years and for 20 of those years, I have longed for an old hutch, just like the one in my grandma's kitchen. Every time we would come across one, it was too expensive or just wasn't exactly what we wanted. My luck was about to change. While visiting a local flea market on Saturday, I walked to the back of the store and saw this. One look and I was immediately transported back to my grandma's kitchen. The sounds, smells, and all the things I loved about her and her kitchen immediately came to mind. When the owner came over to talk to me, all I could manage to say was, "I want this." Of course, it needed some work, but that's what I liked about it. Although I liked the sunny yellow paint, it wouldn't really fit in with the decor in our home so I had to paint it white. You know I'm not crazy about scroll work so I needed to do something to remove or cover it on the top. I also needed to update the door hardware. The hardware on the drawers was perfect and didn't need anything. I decided to add crown molding to the top so I added a 1 x 4 to the top in between the two sides or scroll work. I attached it with a nail gun. 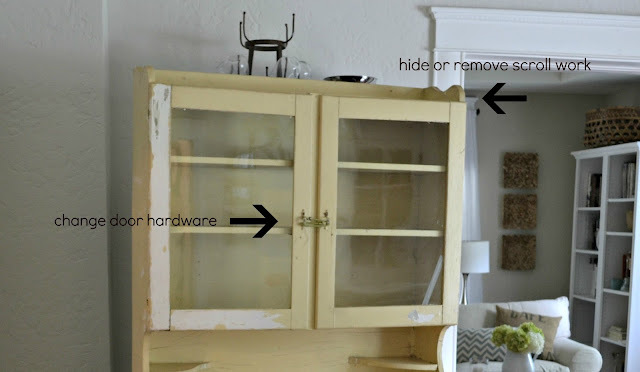 Next, I cut a piece of crown molding and attached it to the 1 x 4 that I just attached on the front and mitered the corners to wrap around the sides of the hutch. As you can see, there are gaps but that's why caulk is the best thing ever for a DIY'er. It covers a multitude of sins. I learned how to cut mitered corners and returns about 9 years ago and every time I cut them, I forget how and have to buy extra molding to practice on. That whole thing of turning your molding upside down and cutting at 45 degrees confuses me every time. I'm sure there is an easier way and possibly a better saw for the job but I don't know what it is. After I caulked the gaps, and filled the nail gun holes with spackle, I started painting and adding the new door pulls. Here's how she looks now. I had two sea grass baskets that I picked up at Lowe's a few months ago that fit perfectly on the second shelf. I filled them with my collection of linen vintage napkins. I also added my coffee sacks and more vintage linens. Plus my collection of old mismatched flatware that hubby brought me. As well as my treasured french compote that I picked up on Etsy. See how nicely the crown molding turned out after filling the gaps with caulk? Here's a closeup of the drawer pulls. I thought they matched the original drawer pulls perfectly. As you can see, I sanded the edges a little to let a tiny bit of the cheery yellow paint shine through. I had to do some rearranging in the dining room but that was fine with me. I still have the shelf I built from reclaimed barn wood, I just moved it to another corner. So, after 20 years, we finally have a hutch that also reminds me of spending time with my grandma. Hey there! Happy Friday to you all! The random number generator chose number 7 as the winner of the bread board giveaway. I've been experimenting (and loving) with "Artisan Bread ..." this summer. I'd love to have a set of these boards! Thanks for the opportunity to win! Congratulations Laura! Please email me your address via the contact page. Thank you! Hey there! Hope everyone is having a good summer week. I've been working like crazy to get more bread boards in my shop. I've gotten kinda lazy about it and started receiving many emails asking if more were coming. So, I've come up with something that I'm really proud of. Now let me back up a bit. Several months ago a friend of ours gave us a truck load full of walnut from trees that were on his property. It was gorgeous but at the time I was so busy, I just put it in storage and kinda forgot about it. Around that same time my hubby came home with these. I really didn't know what they were but from the looks of them, they were what I had been looking for as far as my bread boards were concerned. They seem to be some type of branding iron tool, alphabet punch thingamajig. Only problem was this was all there was. Only a few letters. Fast forward to now. During the time that I've been making these bread boards, I've had lots of people request them to be in walnut instead of maple. So, I decided to offer both my original set and french set of mini bread boards in walnut. These will only be available for a limited time as when I run out of my walnut, they will be gone. Of course, I will always still have them available in maple. And the special touch that I added to each board with the iron tools is this. It is the word "YOU" and I put it there because I thought it was perfect since each board is for an individual special person. I was lucky that out of the few letters I had, I was able to come up with this word. I burned it into the wood by heating up the iron tools. It is very subtle but I think, pretty special. I also brought back my medium walnut board that I had available during Christmas, also with an engraving, but instead of "YOU", I've engraved the word "ONE" because it is a single board and not part of a set. Not everyone may agree, but I think it's a neat touch. As well as my long rustic walnut board. And I've listed a special set of my french set in walnut as well. This is the set that is part of my giveaway. So, it will be available for a limited time in my shop as well. So, if you are interested in any of these things, click here to head on over to my shop. I've also listed more maple mini sets for all those that have asked. Remember, the WALNUT MINI SETS are only going to be available for a very short time. When I run out of this walnut, that's it. I will however still continue to offer the large and medium walnut single bread boards as well as my maple mini bread board sets. I have absolutely enjoyed reading about your favorite breads on my giveaway post and how they evoke cooking memories with your family. Making memories in the kitchen is so much fun and it's amazing how much the smell of baking bread can bring back those memories. That said, all the bread talk made me seriously hungry and gave me a mad craving for some. One of you mentioned a white chocolate cherry bread and the sound of that had me running to the nearest grocery store for the ingredients to make one for myself. Only I didn't use cherries, I used dried apricots because I love their texture in bread. I used the Better Homes and Garden recipe and left out the nuts as my family doesn't like them. I can't even begin to tell you how good this bread is. Besides the chewy sweet tart apricots, there are little pockets of lovely melted white chocolate that pairs perfectly with the chewy apricots and the sweet bread. But it isn't too sweet, it's perfect, I promise. And the crispy, almost caramelized edges push it right over the top. This bread is so good and if I could, I would send you all a slice of it. I am working on a really fun project right now and can't wait to share. It's huge and I've run into difficulties but it involves a very cool huge vintage sign that my hubby found buried in dirt in a barn. So. Cool!!! Stay tuned! Make this bread.........and thank you for all the lovely comments on the giveaway. I smiled at every one of them. Greetings! It's been a while since I've had a giveaway so I thought it was definitely time for another. So, because I love my readers so much and appreciate you taking the time to visit, I've got a special bag of goodies picked out for one lucky reader. I have to tell you, this was so much fun! I love gift giving! This is what is included in the giveaway. I've been experimenting with my mini bread board sets again and mixed and matched from both my mini bread board sets to come up with this set. It's also in walnut, which I really love. If you read my blog, you know how much my bread boards mean to me. Hopefully, these will be offered in my shop soon. First up, a set of 4 mini bread boards. large walnut bread board to go with it. whatever you love with your bread. And this book. I love it. It works, just try it. It also has gluten free recipes for gluten free folks. To enter the giveaway, simply leave a comment telling me your favorite bread. For a second chance to enter, follow me on twitter and tweet the giveaway with my handle included @VintageHomeLove. Leave your second comment with a link to show me you tweeted it. That's it! Comments will be closed and giveaway ends on Thursday, July 12, 2012. I will choose one winner via the random number generator Thursday night and announce the winner on Friday, July 13, 2012. Good luck! Greetings! I hope you all had a lovely weekend. 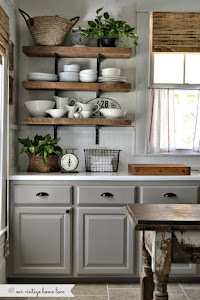 I've said this before but anytime I make a special change in a room, it always seems to inspire other changes, as well. This past week I finally got around to changing out our master bedroom and bath door knobs and plates to the match the porcelain door knobs I put on our pocket door. I got lucky and found just what I needed in my hubby's collection. I was planning to just change them and be done with it but I was so happy with the results that I put a fresh coat of paint on the doors and then decided to also paint our bedroom Classic Gray by Benjamin Moore. I love it so much in our dining room and since our master bedroom is right off the dining room, I thought it was a logical choice. I just wasn't happy with the dark paint in our bedroom anymore. Anyway, I wanted to put a mirror of some sort above our Anthropologie inspired dresser, so, I scoured the internet with ideas and came across this photo. I absolutely loved the somewhat whimsical, chic simplicity of it and knew I could create a fun version for our bedroom. Here's what you need. This mirror cost less than $30 to make. I used two boxes of mirror tiles from Lowe's, 1 x 2's and a sheet of ceramic tiles. (You need to remove the little square tiles from the sheet.) First thing I did was build a frame with the 1 x 2's. My frame is 3 feet x 4 feet, which is the size of 12 tiles. I put the whole thing together with our nail gun. Next, I attached a piece of scrap wainscot to the top of the frame with finishing nails. Don't worry if it doesn't fit your frame perfectly. Before I moved on to the next step, I wrote all our love sayings on each individual mirror tile with a silver permanent marker. I chose our sayings from cards that I save from my hubby and kiddos. I always save the cards they give me and this worked out perfectly. It's best to have that step finished before attaching the tiles to the frame. Then I applied mirror adhesive to the frame and began laying down my tiles. These photos aren't as great because it was late at night when I was working on this part. After laying down all the tiles, I took the tiny ceramic tiles and glued them to each center connecting all four corners. Then I painted the frame white to match the ceramic tiles. After that, I cleaned off all my fingerprints, let it cure overnight flat on the ground and then attached a wire and two screw eyes to the back to hang it on the wall. Here's how it looks in the room. This mirror just makes me smile every time I walk into our bedroom. It's fun and whimsical and I love how each saying reminds me of a special occasion with my family. I also love the generous size of it. You could also make a smaller version though, if you needed to. I know this kind of art isn't for everyone but it sure makes us happy!